You have probably read about the perils of loneliness as you age. And, how feeling alone can actually reduce your life span by as much as regular smoking does. However, did you know that some research suggests that it is not just a matter of having relationships, it is also who your friends happen to be. And, it turns out that older people can really benefit from friendships with younger people (and vice versa). 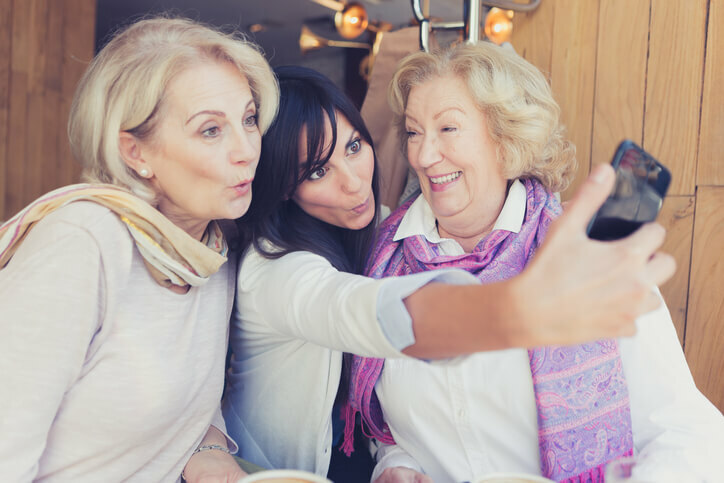 Learn about these benefits and discover a few beautiful examples of intergenerational friendships. Gina Pell, founder of The What, is technically a member of Gen X. However, she wants to shed that label and has coined the term “Perennial” — referring to people who are relevant across generations, no matter their age. Sense of Purpose: Sometimes friendships with younger people become a mentorship. Passing on your skills and knowledge is a powerful way to achieve a sense of purpose for your life. Broader Perspective: No one wants to become the stereotype of an angry rigidly thinking old person. Having younger friends can help broaden and freshen your perspective. Learning about new ideas, new music, technology and more can really keep you young and happy. Boosts Energy: Whether it is toddler grandkids, teens or someone in middle age, the young are generally active and engaged. That energy can be infectious and stimulating. Really though, the net effect of having younger friendships is that they can simply help keep you young at heart. “Faces Places” (Visages Villages) is the Academy Award nominated and Cannes festival winning film directed by Agnes Varda, an 89 year old director. For this film she teamed up with the hip 33 year old photographer and street artist, JR. The duo hit the road to document the stories and images of rural France and tell the story of their somewhat unlikely but heartfelt friendship. The trailer is below, but you can also catch this film in select theaters or on some streaming services. “Keep on Keepin On” documents the mentorship and friendship between jazz great Clark Terry (91 at the time of filming) and young piano protege, Justin Kauflin. The joy that the two give each other is clear and moving. Young Kauflin is clearly not the only beneficiary of this relationship. Their friendship began online — playing Words with Friends, a scrabble like game. They ended up playing hundreds of games together and started discussing current events and their lives. They eventually met in person and experienced a natural easy friendship — nothing like what you might expect from this study in opposites. Bill Teoh was the stereotype of a grumpy old man — relishing his time alone. “I really don’t fancy any extra company,” he said. He strongly believed that everything was better when he was young and that the youth of today are wasting their time on nothing but video games. Enter 14 year old Kieyron Maldini and a bit of a social experiment that results in a rather amazing transformation in both Teoh and Maldini. After the 10 week experiment, young Maldini scored hugely better on tests of his self esteem. And, Teoh not only warmed to friendships, becoming more open, he also saw rather miraculous improvements in his health. At the end of the study, Teoh saw gains in his mental dexterity, processing speed and fitness. In the sit- and stand- test he went from 8 repetitions in 30 seconds, to 15 repetitions. Watch their story here. Or, read more details. “I liked your face,” said 80 something-year old Austin about why she struck up a friendship with 40 something-year old Viktor. Oddly enough, the two eventually became truly the best of friends — even a great romance. Do You Have Younger or Older Friends? What have your experiences been with friends who don’t fall within a small age range? Share your insight in the comment section below. Inspired to make some younger or older friends? Let us know how it goes! Making Sense of Retirement -- 74 Great Movies About Retirement and Aging -- Updated List 2019!